The following sets out the Website Terms and Conditions or rules that govern Your access to and use of this Dundee City Box Office Website which is operated by Us (Leisure and Culture Dundee, Scottish Incorporated Organisation Number SCO42421 and having our principle offices at 1 Shore Terrace, Dundee DD1 3AH). You expressly agree to be bound by these Website Terms and Conditions and all applicable laws. The Effective Date of these Website Terms and Conditions is 1 April 2011. We may change these Website Terms and Conditions from time to time. You should therefore check the Effective Date each time you visit the Site. If you do not agree to any of these Terms and Conditions then you should leave this Website immediately. All intellectual property rights (including but not limited to trade marks, copyright and database rights) in the material, information and computer files on the Website ("materials") are owned by, or are licensed to Us by third party licensors. Nothing in these terms and conditions transfers to You any rights of ownership of such intellectual property rights or constitutes a licence to use such intellectual property rights other than to the extent expressly set out in these Website Terms and Conditions. You may copy any materials to the extent necessary to view this Website using normal browsing software. You may not modify, distribute or reproduce the materials in any manner and for any other use without Our prior written consent. Notwithstanding the foregoing We may from time to time expressly give you the opportunity to download specific computer files or other content from this website, for example, files containing artiste demonstrations or materials, or other content, or marketing materials ("downloads"). Such downloads are subject to these Website Terms and Conditions and any other terms and conditions you accept during the installation process of the downloads. You may copy downloads to the extent necessary to view them. You may not remove any product identification, copyright notices or other notices from the materials or downloads, or any copies thereof which you may have made for your own personal use. Any unauthorised downloading, use, copying, modification or distribution of the materials or downloads or other content on this Website may be in breach of statutory or common law rights which could be the subject of legal action against You. Materials, downloads or other files or content on this Website may contain or display trade marks that are not owned by Us but which we are permitted to display on this Website. We do not make any claim of ownership in relation to any of these. All rights not expressly granted are reserved by Leisure and Culture Dundee. 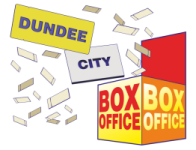 If You wish to provide a link to the Site this must be to the Dundee Box Office which is currently at http://www.dundeebox.co.uk. You are not permitted to frame, or link to any other page of the Site. You are not permitted to use any robot, or other automatic device or manual process to monitor or copy the web-site or the content expressed herein. We may provide links from this Website to other websites operated by third parties. Links to third party websites are provided for Your convenience only. We are not responsible for the management and control of such links or for any such third party websites and do not endorse or recommend the views expressed on any of these. We are not responsible for the contents of other third party websites or pages which link to this Website and shall have no liability in respect of any other third party websites. We reserve the right, at any time and without notice, to change this Website and any materials, downloads or any other content contained within it. ALL LIABILITY (OTHER THAN LIABILITY FOR DEATH OR PERSONAL INJURY) RESULTING FROM ACCESS AND/OR USE OF THIS WEBSITE, MATERIALS, DOWNLOADS OR ANY THIRD PARTY WEBSITES. WE SHALL HAVE NO LIABILITY TO YOU FOR ANY DIRECT, INDIRECT, SPECIAL, INCIDENTAL OR CONSEQUENTIAL LOSS OR DAMAGE OR DAMAGES FOR LOSS OF PROFITS, LOSS OF CONTRACTS, LOSS OF CUSTOMERS, LOSS OF BUSINESS OPPORTUNITIES, LOSS OF EMPLOYEES, LOSS OF DATA, LOSS OF GOODWILL WORK STOPPAGE OR ANTICIPATED SAVINGS, LOSS OF REVENUE WHICH MAY ARISE FROM YOUR ACCESS TO AND/OR USE, INTERRUPTION, NON-PERFORMANCE OR NON-AVAILABILITY OF THIS WEBSITE OR MATERIALS OR DOWNLOADS WHETHER SUCH LOSS OR DAMAGE OR DAMAGES ARISE IN CONTRACT, DELICT, NEGLIGENCE OR OTHERWISE. We will use reasonable endeavours to ensure that this Website, materials and downloads do not contain any viruses or other malicious code. It is however Your responsibility to ensure at all times that your computer system is reasonably well protected and maintained with up to date virus protection software. These Terms and conditions shall be construed in accordance with Scots Law and you hereby submit to the non-exclusive jurisdiction of the Scottish Courts.